dinarily used needle for intramuscular injections. mm point from the tip of the needle to the base. sychotics are often used in the treatment of these patients. less painful than injection into the deltoid muscle . *Disclosure of interest: The authors report no conflicts of interest. per outer quadrant of the buttocks [14,15]. only in the gluteal muscle. 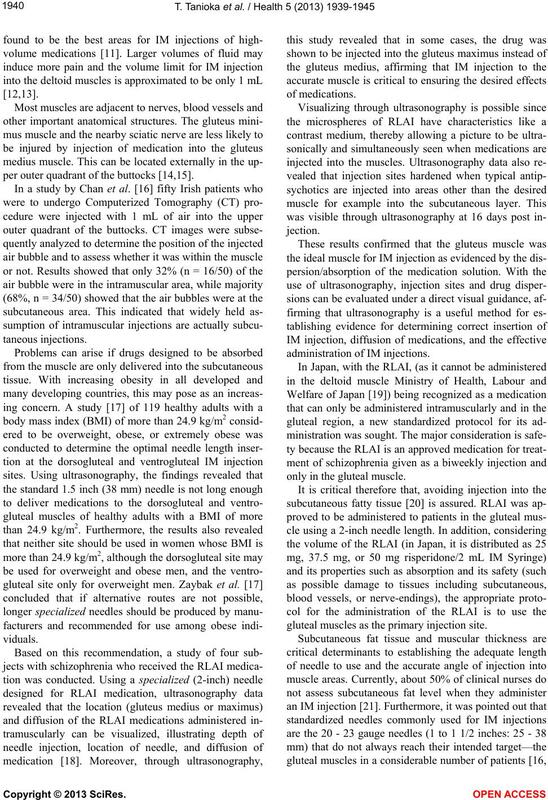 gluteal muscles as the primary injection site. quadrant (land marking is done by making a double cross. with IM injection site and ultrasonograph probe. abscess or granuloma formation at the injection site . were women. They were all prescribed to receive RLAI. the Tokushima and Aomori prefectures in Japan. rior iliac spine to the greater trochanter of the femur. at the gluteal region (See Figure 1(b)). from Tokushima University Hospital’s Ethics Committee. with normal and high BMI. ferent between the groups with high and normal BMIs. Table 1. Distribution of BMI. BMI: body mass index (kg/m2), Normal BMI: 18 - 25, High BMI: >25. the iliac bone (DEI) was 54.7 mm (left), 55.9 mm (right). mm (right). DEI was 71.9 mm (left) 75.9 mm (right). patient with a normal BMI schizophrenia, aged 52.
from epidermis to the ilium was 55.9 mm. Table 2. Body mass index-based differences in patients with schizophrenia. INL (mm) 39.0 34.8 40.8 27.0 - 47.045.5 37.5 46.0 30.0 - 50.0 −1.34 n.s. DEUF/left (mm) 16.0 13.6 20.0 10.5 - 19.020.2 12.6 21.3 10.3 - 27.1 −0.48 n.s. DEUF/right (mm) 15.7 12.5 15.9 10.3 - 19.716.5 13.1 19.5 11.1 - 25.0 −0.27 n.s. Whitney U test, ***p < 0.001, **p < 0.01, n.s. : not significant. 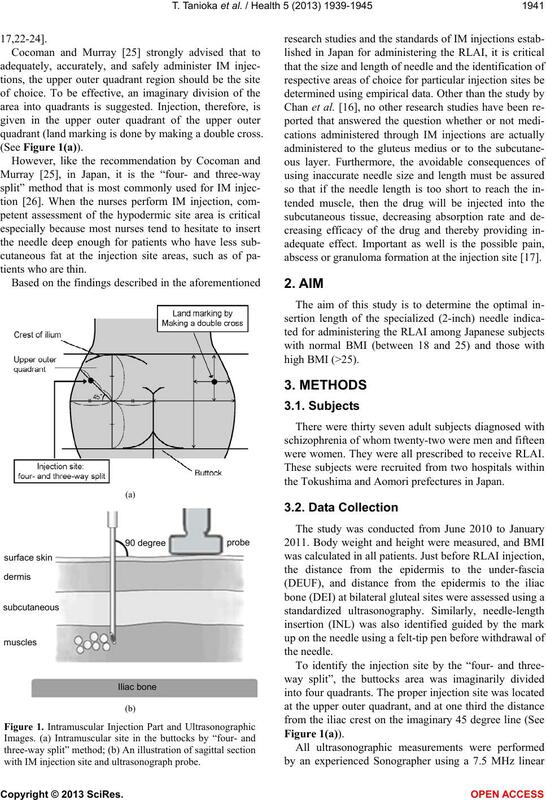 correct gluteal muscle injection site. other than the specialized needles for RLAI are used. untoward or side effects such as reaching the iliac bone. marked at the 40 mm level to indicate the insertion limits. choice to find the ideal gluteus muscle. muscle regardless of the patients’ BMI. to equalize the numbers of people in the gender groups. 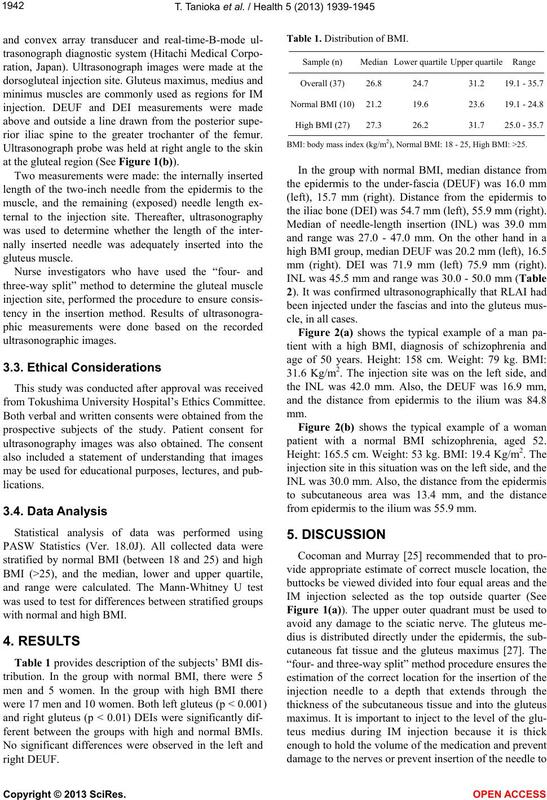 thickness of subcutaneous fat and the subsequent muscle. 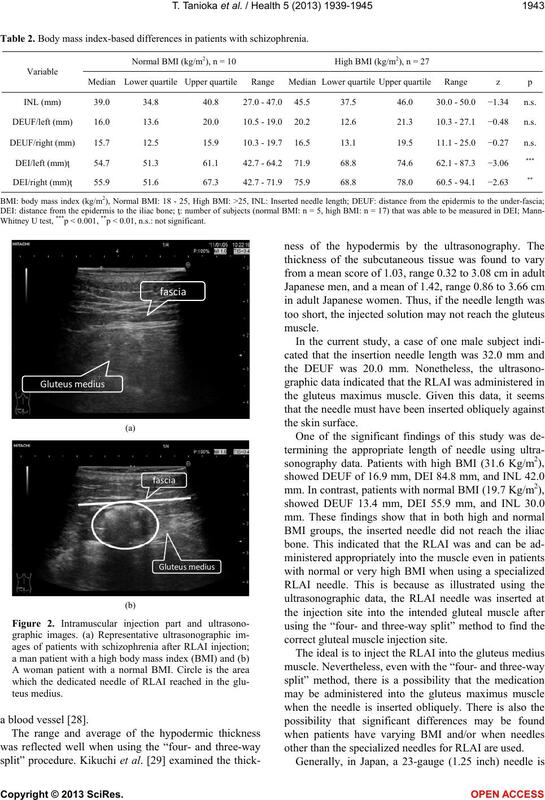 viding evidence using ultrasonography data. profiles for non-adherence to antipsychotic medications. and medication adherence in persons with schizophrenia. Archives of Psychiatric Nursing, 25, 269-283.
jection techniques. Nursing Standard, 12, 39-41.
fectiveness. 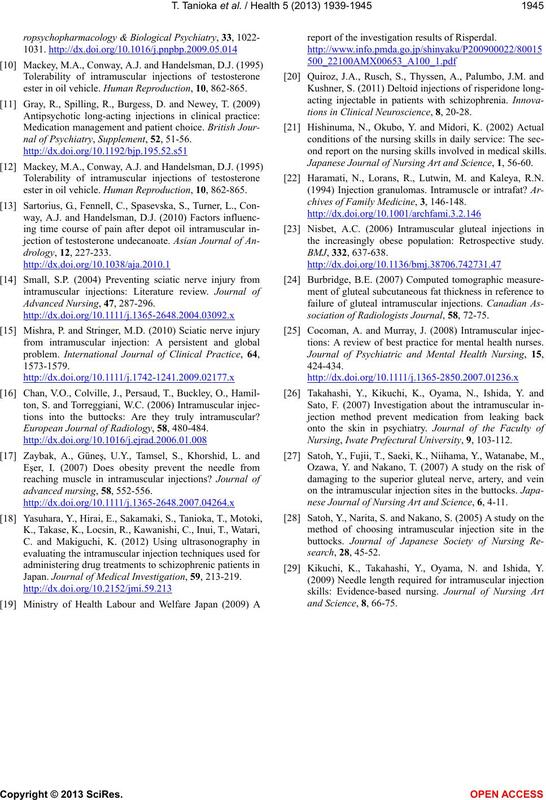 Expert Review of Neurothertapeutics, 9, 9-31.
site? PRN Forum, 2, 2-3.
myopathy. Acta Neurologi ca S candinavica, 78, 167-176.
ester in oil vehicle. Human Reproduction, 10, 862-865.
nal of Psychiatry, Supplement, 52, 51-56.
tions into the buttocks: Are they truly intramuscular? European Journal of Radiology, 58, 480-484. Japan. 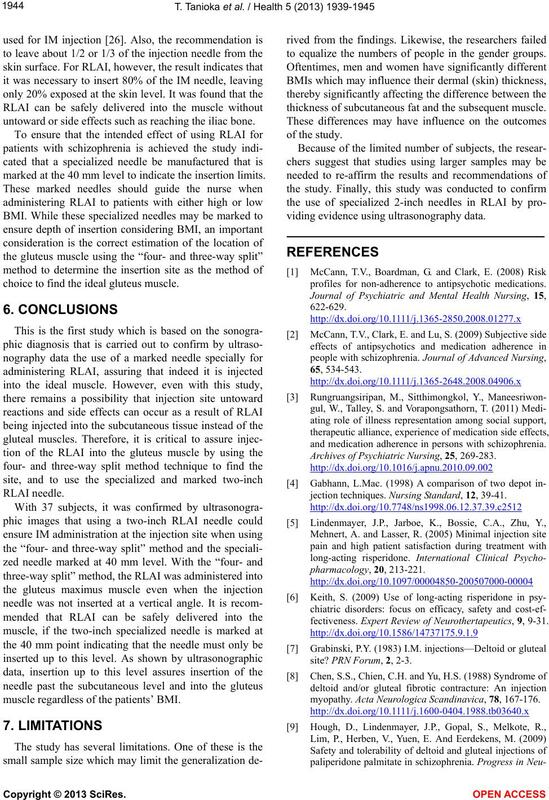 Journal of Medical Investigation, 59, 213-219.
report of the investigation results of Risperdal. tions in Clinical Neuroscience, 8, 20-28.
ond report on the nursing skills involved in medical skills. Japanese Journal of Nursing Art and Science, 1, 56-60. Haramati, N., Lorans, R., Lutwin, M. and Kaleya, R.N. chives of Family Medicine, 3, 146-148.
the increasingly obese population: Retrospective study. sociation of Radiologists Journal, 58, 72-75.
tions: A review of best practice for mental health nurses. 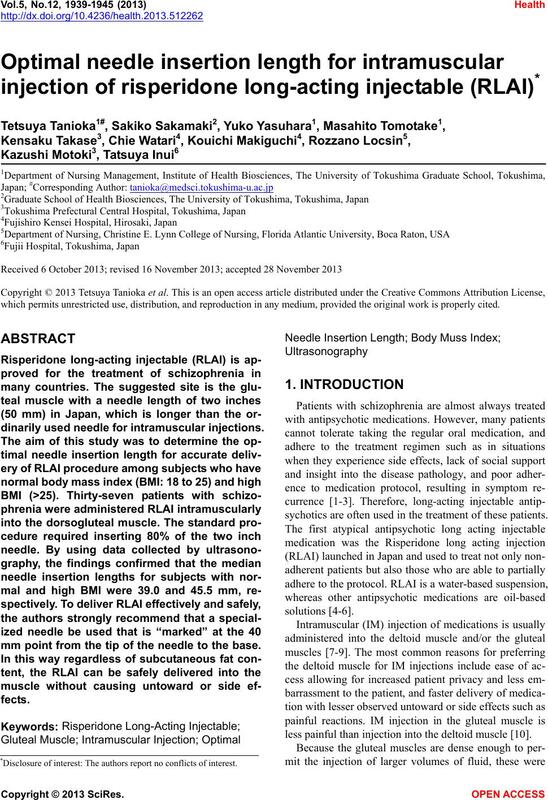 Nursing, Iwate Prefectural University, 9, 103-112.
nese Journal of Nursing Art and Science, 6, 4-11. Kikuchi, K., Takahashi, Y., Oyama, N. and Ishida, Y.